Only foreign/overseas delegates registered in the congress can participate in the Plant Tour. Requests can be made on the Registration Form. Some visits may be cancelled if there is insufficient interest. For details, please see the Plant Tour and Registration Form.. The cost includes accommodation, meal, air/train tickets, touring guide, traffic fee and tax etc. Delegates,who cancel their plant tour booking with email/written cancellation letter/fax recieved, after 16 August 2017, will have no refund of plant tour fee. meal, air/train tickets, touring tickets, touring guide, traffic fee, tax, etc. Changchun Longjia International Airport(CGQ), Arrival Time: before 14:00, Sep.23, 2017. A Hotel in Wuhan, Arrival Time: before 18:00, Sep.22, 2017. Chongqing Jiangbei International Airport (CKG), Arrival Time: before 12:00, Sep.22, 2017. Hangzhou Xiaoshan International Airport (HGH), Arrival Time: before15:00, Sep. 22, 2017. Nanjing Lukou International Airport(NKG), Arrival Time: before 13:00, Sep. 22,2017. Nanjing Lukou International Airport(NKG), Arrival Time: before 15:00, Sep. 22,2017. Zhengzhou Xinzheng International Airport(CGO), Arrival Time: before 15:00, Sep. 22, 2017. Jinan Yaoqiang International Airpart (TNA), Arrival Time: 13:00, Sep. 22, 2017. 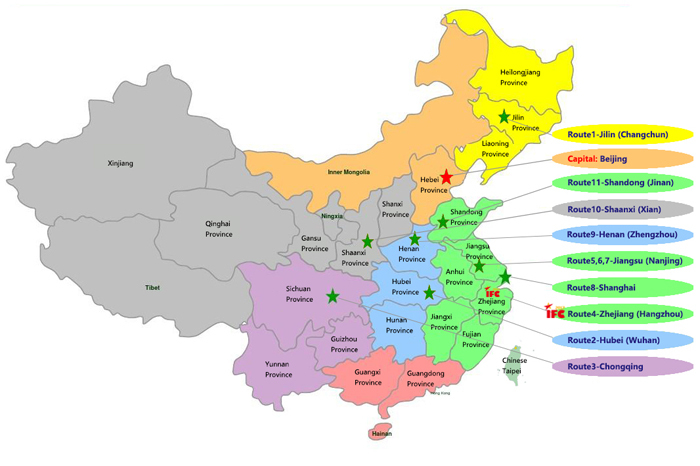 FAW Forge (Jilin) Company Ltd.
Changchun City Hongda Forging Co., Ltd.
Baicheng ZhongYi Precise Forging Co., Ltd.
Liaoyuan Fangda Forging Co., Ltd.
Hubei Shenli Forging Co., Ltd.
Dongfeng (Shiyan) Jinggong Gear Co., Ltd.
Chongqing Dajiang Jiexin Forging Inc.Ltd. Chongqing Chuangjing Warm Forging Forming Co., Ltd.
Chongqing Qingzhu Machinery Manufacture Co., Ltd.
Chongqing Qingling Forging Co., Ltd. Forge Plant of Wanxiang Qianchao Co., Ltd.
Zhejiang 8+1 Precision Machinery Forging Co., Ltd.
Jiangsu Hongbao Forging Limited by Share Ltd.
Jiangsu Longcheng Precision Forging Co., Ltd.
Nanjing Automotive Forging Co., Ltd.
Nanjing Develop Advanced Manufacturing Co., Ltd.
Jiangsu Pacific Precision Forging Co., Ltd.
Jiangsu Senwei Precision Forging Co. Ltd.
Jiangyin Quanhuafeng Precision Forging Co. Ltd.
Wuxi Turbine Blade Co., Ltd.
Shanghai Changte Forging Co., Ltd.
Jiangsu Baojie Forging Co., Ltd.
Luoyang Huaguan Gear Share Co., Ltd. Forging Plant of Luoyang LYC Bearing Co., Ltd.
Henan Zhongzhou Fuman Forging Co., Ltd.
Shaaxi Huawei Forging Co., Ltd.
AVIC Shaanxi Hongyuan Aviation Forging Company Ltd.
Shandong Wenling Precision Forging Technology Co., Ltd. Casting & Forging Center of China National Heavy Duty Truck Group Co., Ltd.